For most of his professional life, Richard Ellis has been an outspoken advocate for the world’s marine creatures. A prolific artist, author, naturalist, and activist, he carries a firm belief that the problems associated with his marine subjects are due to our lack of knowledge and awareness. A tireless crusader for the world’s ocean life, he has written and illustrated 17 books on various marine subjects, including The Book of Sharks, The Search for the Giant Squid, and The Empty Ocean. He served on the US Whaling Commission from 1980 to 1990, holds an unpaid position in the paleontology department at the American Museum of Natural History in New York, and is recognized as one of America’s foremost painters of marine natural history subjects. 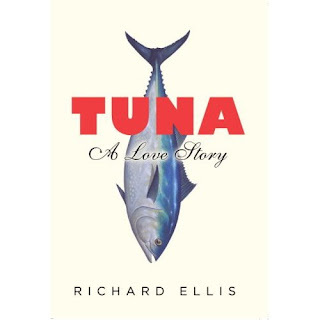 On a recent afternoon, Mr. Ellis, sat down in his Manhattan apartment to discuss his latest effort: Tuna: A Love Story. I have always been an animal lover – for want of a better term – I would go to the Natural History museum when I was 10 and sit in front of the dioramas and draw. They were easy to draw because they didn’t move around much. You chose the museum over the zoo, because the animals didn’t move around? No, the museum was warmer. My career, such as it is, began as an exhibit designer when I got out of the army in 1961. I figured that if I could paint a picture of a bear I could get a job at the Natural History Museum because very few other people could even do that. So I have this ability to arrange things so they look nice. I designed the whale that hangs there. I would describe myself as a person who has the ability to present issues of natural history in a way that I hope makes people aware of the nature of the problem – the subjects of all of my books have problems attached to them. I would like to have a book on my shelf and since there isn’t one I’ll make one. It’s all about my unwillingness to let people be ignorant. You should care about what has happened to tuna, to whales, to tigers, to polar bears. We are being directly responsible for their demise. And this makes me very, very angry. Few of my books have any real anger in them. I save the anger for the research and the writing. I still think that if you can make people understand what a wonderful creature the Bluefin Tuna is, maybe they will say, ‘lets not keep supporting the killing of them’. Now I don’t know whether that works, but I’ve reached the stage where I can’t change careers. Yeah, sure. But that is not the way to solve the problem; your refusing to eat fish is not going to save the tuna, because people are still catching them in very large numbers. were killing whales. The illegitimate concept was that when we took these petitions to the Japanese embassy the ambassador would say, “Oh my goodness, we are killing all those whales! We will stop!” Of course they didn’t but ultimately the problem got ratcheted up to a much higher level and when I was on the whaling commission, I realized that we had essentially begun the processes. I have written this big, fat book about tuna largely because when I would talk to people they would have no idea what I was talking about. Nobody had ever heard about tuna farming, this huge industry that is on the brink of wiping out Mediterranean tuna stocks. Conservation efforts are often centered on iconic species such as lions, tigers, and whales. Do you see the Bluefin moving into that echelon? Well I tried to put it there. I think that it is difficult to envision a fish as a user-friendly, iconic, furry, big-eyed creature. Fish don’t have expressions. They live in a different environment. They don’t make any noises. They are seen first as food items, second as fishing targets, and only as a last resort as animals that need to be saved. I have talked about its speed, its warm-bloodedness, its intelligence, and its beauty. I feel that way about it, that’s why I called my book A Love Story. It’s obviously a play on words but the fact is that everybody who thinks about tuna loves them. Some of them think about tuna so they can eat them. Some think about tuna so they can make vast amounts of money. Your next book is about polar bears? The polar bear has become the first animal threatened by global warming. My wife said, “Why don’t you write about polar bears?” I said I already have all these books about polar bears. But all of a sudden I realized that nobody had written a book about the polar bear and global warming. As the polar bear has become one of the iconic images of global warming, is the Bluefin the iconic image of overfishing? Yeah, but I don’t think of it in those terms. It just ended up that way. I don’t know why I started writing a book about tuna. There is a chapter in the Empty Ocean book on tuna. Maybe I was just reading too much about the demise of the Bluefin. Which of your books are you the most proud of? The one I’m working on. Always. I think, ‘What is going to happen with this?’ Am I going to go on Charlie Rose and talk about polar bears and people are suddenly going to be aware of these problems? I love doing it - the writing, the research, everything. I’m not an optimist. Do I think any of these things are going to get better? No. But I’m hopeful that my grandchildren will benefit not only from what I’ve done but what other people have done in terms of conservation. It breaks my heart to think that they will never see a Bluefin or a polar bear. It’s a wild exaggeration, but if things take a real downturn polar bears could be extinct by 2050. I am emotionally attached to extinct animals. My book, No Turning Back was largely about animals that we have lost. If I’m doing anything – I suspect I’m not doing much of anything – it would be to raise the alarm. If we are not careful we are going to lose these things, because look at all the ones we have lost already.